So for my example, Work Package is The wall. Activities can be: Find the cheapest Bricks, Build the wall, and Paint the Wall. 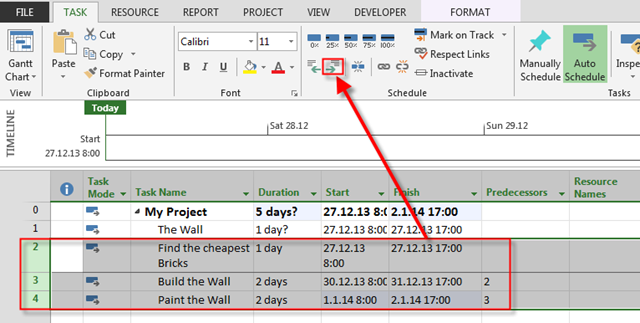 As you can see Work Package: The wall will have 5 days of Duration, because in network Diagram the longest duration for Activities will take 5 days (together). This entry was posted in MICROSOFT PROJECT, Microsoft PRoject 2010, Microsoft Project 2013, MS PROJECT 2010, PMI, PRoject Management and tagged Microsoft Project 2010, Microsoft Project 2013, MS PROJECT, MS PROJECT 2010, MS PROJECT 2013, MS PROJECT 2013 - TASKS!. Bookmark the permalink. A question: and a ‘workstream’, where would it fit? Can you describe how did you draw the picture of activity diagram shown in this post? Did you use any specific software? Is that representation manual or automatic? Thank you very much for your contributions. I’m learning a lot from your blog.